A sports widow is “mad as hell” and she’s not going to take it anymore! The football commissioner mysteriously resigns. A cheerleader stages her own kidnapping. A referee is up to his ears in drug deals and bad calls. This deadly game goes into overtime for an intricate scheme of revenge and cover ups that invites a lot of audience participation. 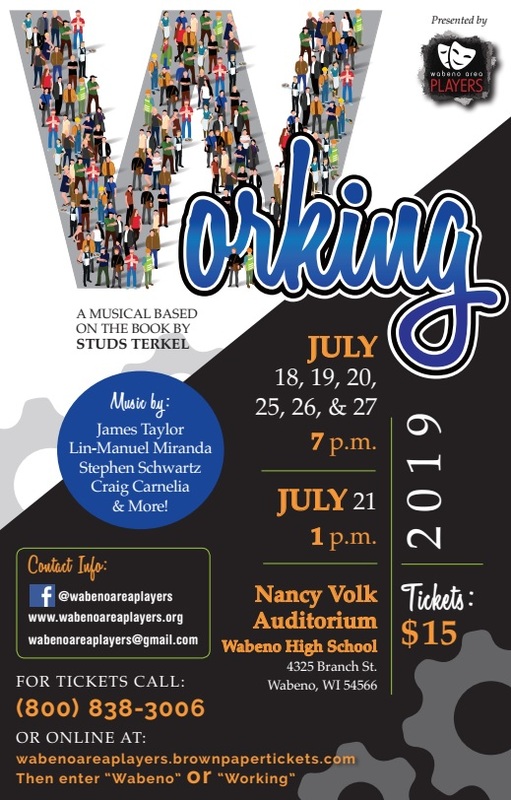 If you are interested in participating or would like to schedule an audition please call (715) 889-1606 or email wabenoareaplayers@gmail.com. All auditions must be complete by September 20th. If acting is not for you, we have positions on the stage crew and other supportive roles. This production will take place November 15-18, 2018. The rehearsals will begin in October. You can purchase tickets for this show by going to wabenoareaplayers.brownpapertickets.com or by calling (800) 838-3006. 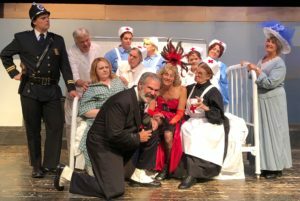 The cast of The Dastardly Doctor Devereaux. Lotta Cash, a wealthy widow, must be on the lookout. The evil Dogsbreath Devereaux, M.D. plans to marry Lotta so he can inherit her fortune and her late husband’s clinic. Helping him is the nasty nurse, Hilda Hatchet, whom he promises to wed after he gets rid of Lotta. Wild? Well, talk about medical mania when the insanely jealous Hilda catches Dogsbreath flirting with our heroine, Wendy March. We can only hope that Dr. Phil Good, our hero, can save Wendy and the unsuspecting Lotta from certain death. With an abundance of zany patients, wild tunes (’How Do You Bandage a Broken Heart?,’ ’Emergency,’ ’Do the Bop,’ etc.) and a hilarious plot, this musical melodrama will certainly have you in stitches all the way! As they say, Nurses! Foiled again! 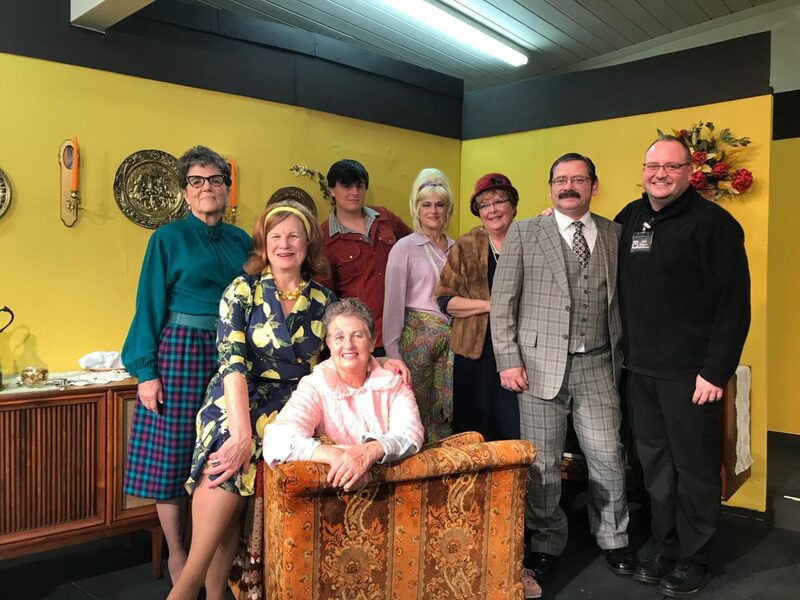 The cast, crew and patrons of Wabeno Area Players Production of And Miss Reardon Drinks A Little raised over $700 and several boxes of food items for the New Hope Shelter & Transitional Housing. Every year Wabeno Area Players chooses a local organization or group to sponsor as another way to give back to the community. This year it was New Hope Shelter & Transitional Housing. The reason New Hope Shelter & Transitional Housing was chosen was all that it gives back to those in need. “We are lucky to have an organization, director, Micah Dewing, and staff in our community to help those that need it. They really need funds to drive the programs they have. If you want to support a local organization that gives 100% back, please give to them this holiday season.” stated Josh Jameson, Wabeno Area Players President. 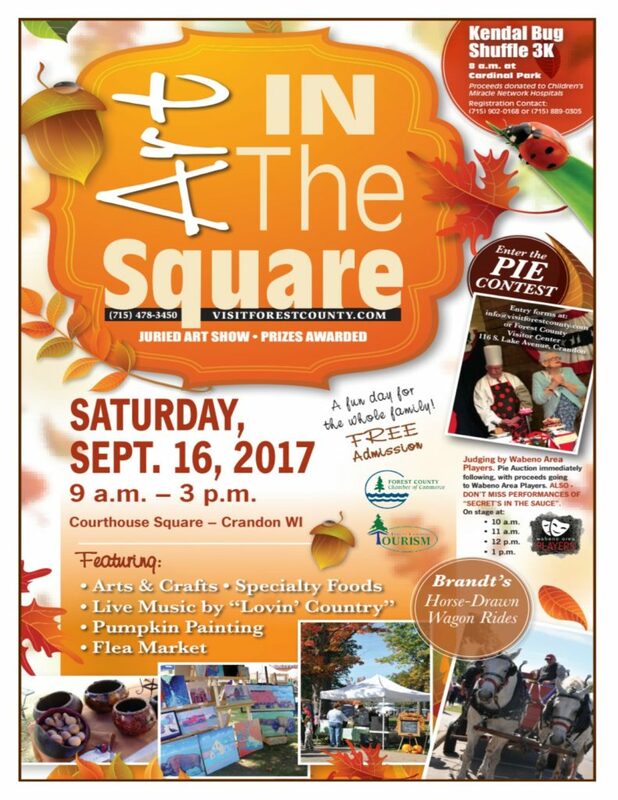 The performances are free and open to the public and will be in the Courthouse Square during Art in the Sqaure. Performance times are 10 a.m., 11 a.m., 12 a.m. and 1 p.m. Following the 1 p.m. performance awards will be presented to the actual Pie Contest Winners and an auction of the pies will be held. 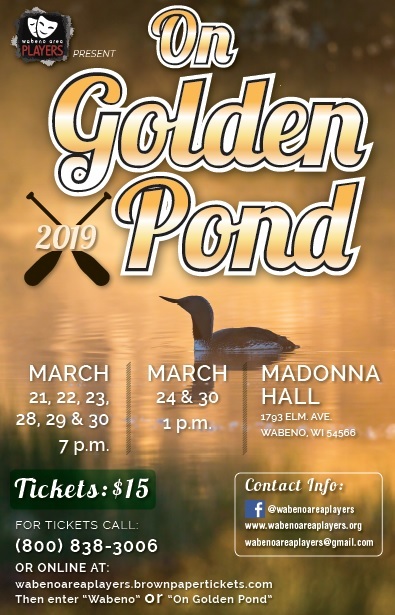 All proceeds raised from the auction will go towards the Wabeno Area Players and the Erna Rousseau Scholarship which is awarded to students from Crandon, Goodman-Armstrong Creek, Laona and Wabeno. These scholarships include college scholarships to high school graduates and current high school students going to camps and clinics. Julia Child returns to Forest County along with her good friend (or enemy) Mario Batali. They try to out do each other with the pies they have created for a special contest between the two. Who can guess the secret ingredient in each others pies? Who will win? Will fireworks fly between the two? What is the secret ingredient in each pie? There is no cost to enter the Pie Contest. The contest is for amateur bakers only. The pie must be entered in the name of the person who made it, and entrants must be 18 years or older to participate. The pie categories are limited to three: fruit/vegetable, cream, and nut. Each pie must be baked in a disposable pie pan, and must be made from scratch. Store-bought pie filling or crust may not be used. 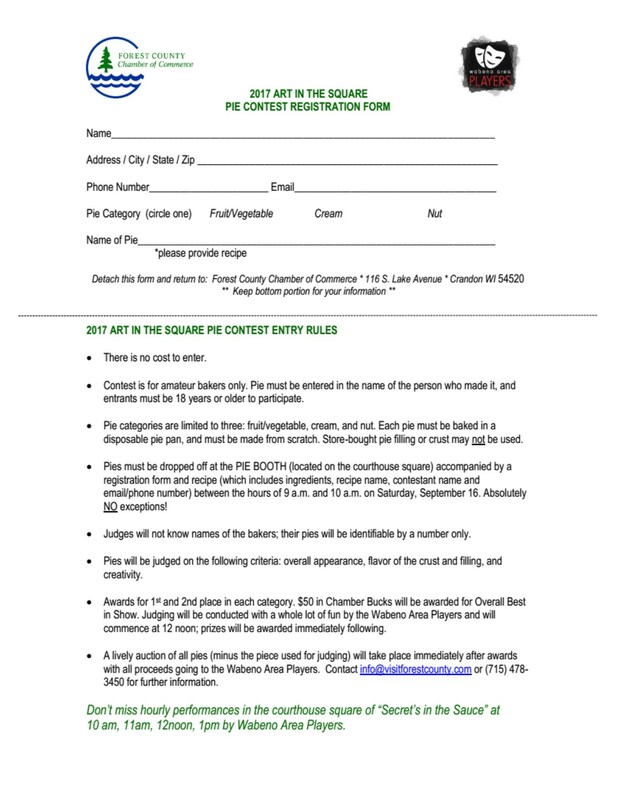 The pies must be dropped off at the PIE BOOTH (located on the courthouse square) accompanied by a registration form and recipe (which includes ingredients, recipe name, contestant name and email/phone number) between the hours of 9 a.m. and 11 a.m. on Saturday, September 16. Absolutely NO exceptions! The judges will not know names of the bakers; their pies will be identifiable by a number only. The pies will be judged on the following criteria: overall appearance, flavor of the crust and filling, and creativity. 1st and 2nd place in each category will receive awards. $50 in Chamber Bucks and Season Tickets to the 2018 Wabeno Area Players Productions will be awarded for Overall Best in Show. 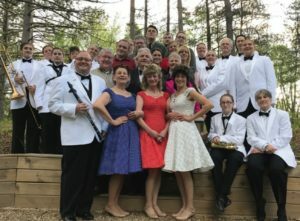 Judging will be conducted with a whole lot of fun by the Wabeno Area Players and will commence at 1 p.m.; prizes will be awarded immediately following. A lively auction of all pies (minus the piece used for judging) will take place immediately after awards with all proceeds going to the Wabeno Area Players. Contact info@visitforestcounty.com or (715) 478-3450 for further information.